Our team of subject librarians are available to help you find quality information for your assignments or essays. Find out who the subject librarian is for your subject and what they can do to help you at our Subject Support Pages pages. The Reading Room will remain open from 8.30 - 01.30 every day over the weekend. 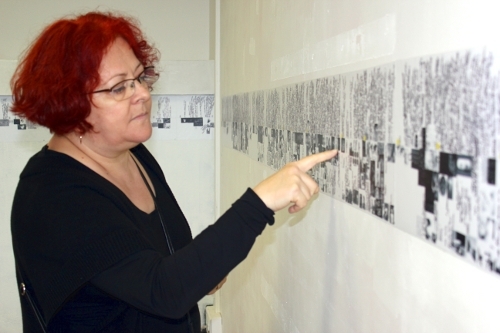 From Tuesday 1st November, as part of the Tulca Festival, the Library foyer will host a mixed media display of work from acclaimed Romanian artist Lia Perjovschi. Lia Perjovschi’s multidisciplinary practice recovers, collects, and disseminates the information which has been inaccessible to Romania until 1989. Her works are neither installations nor performances; they look like offices for individual research, reading rooms or places for debates; the focus is the body of art. Her work examines what, how, and ultimately who, enters into the archive of history, mapping the connections in history, history of art, theory, politics and language. On Sat 5th Nov she will host a talk on her practice in the Library Browsing Room at 3pm- this is a free event, and no booking is required. Hansard, the record of debates in the Houses of Parliament at Westminster, is now available as part of the House of Commons parliamentary papers database covering the years 1803-2005. This database also contains the Eighteenth Century sessional papers collection, containing material published by the Houses of Parliament, 1688-1834. From Monday 14th November 2011 entry to the Library Reading Room, during all hours of opening, will require you to activate the access control system via your University ID Card. This measure is being implemented on foot of student feedback so as to ensure that the space is retained for NUIG students only. Indicate if you are, or are not, already on the access control system. Please Note – Post 13th November you will not be able to enter the Library Reading Room unless your University ID Card has been coded to allow you access. Assignments due? Need help with writing? The Academic Writing Centre in the Library is now open for business. The Centre offers drop-in assistance to all undergraduates with essays, assignments, reports and the general development of writing skills. Monday to Thursday evenings 19.00-21.00 in the Consultation Room in the Library Foyer. Bíonn seirbhís Ghaeilge ar fáil maidin Dé Céadaoin agus maidin Dé hAoine (11.00-13.00). More information is available on the Library Website. In order to facilitate the completion of the current refurbishment works on the Library Reading Rooms this area will remain closed to the public until Monday 24th October. RSC Publishing would like to highlight essential planned maintenance to the RSC Publishing Platform on Saturday 8th October 2011 at 08.00 – 12.00 GMT, which may affect performance and accessibility of content.